Keen readers of SnowSphere Magazine may know that we also write for a plethora of other winter sports publications, spreading our knowledge of the world's most remote ski resorts to the rest of the snow sports fraternity. 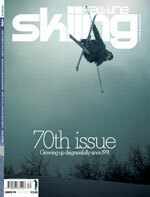 This season you'll find monthly SnowSphere columns in Snowboard UK (A Line Less Ordinary) and Fall-Line Skiing (Come to Snowy...) where we'll be bringing you coverage of such unlikely ski destinations as: India, Lebanon, Slovenia, England, Israel, South Africa, Kazakhstan, South Korea, plus many more places you probably didn't realise had snow, let alone mountains and ski resorts. Also keep your eye out for our features that are appearing in Tribe Magazine, Ski and Board and WhiteLines amongst others this season.